Things I liked: This is a fine little scope with clear glass throughout the magnification range, lockable turrets, and a side adjust AO. The mil-dot reticle is much thinner than the old Bug Busters, making this scope ideal for target shooting, or wherever a wide field of vision isn't needed. It comes in a nice box. What others should know: For mounting to dovetails a set of rings/one-piece mount is needed as the rings included fit only Weaver/Picatinny rails. Things I liked: Clear glass and the side focus is great. Worked well on my streamline. Really liked that it came with a sunshade. Things I would have changed: Would like to add a lock ring for the eye focus. Things I liked: Clear and easy to install. Things I would have changed: Easier target acquisition. A heart beat will cause lost of sight picture. Bigger front scope tube for sun. What others should know: Its a nice scope for beginners. Things I liked: Nice compact size , side focus feature , target turrets , easy to sight-in ,nice flip-ups , light weight , sunshade included. Things I would have changed: Controls seem a little stiff , mostly the side focus maybe will improve with use? What others should know: If you're looking for a smaller scope with features included look no further. Things I would have changed: The Quick detach rings don’t seem to stay in place after a while. The tension adjustment for the rings is a set screw located at the pivot point of the lever, and it tends to come loose with use. Remove the screw and add a drop of blue loctite, then reinsert the screw and adjust to desired tension. I do this to all of my UTG QD rings and have never had a problem. Things I liked: Light weight. Built strong. It is clear. Small size. Fits perfect on my rainstorm. What others should know: Depending on what gun you mount it on, may need a adjustable one piece mount. On my hatsan flash, eye relief wasn't good. Had to crawl up stock when shooting. One peice adjustable fixed it. Things I liked: I really like that it is a complete package. Scope, mounting rings, and the rest. Things I would have changed: I needed a dove tail adapter to use the rings that came in the package but that was not really a problem. What others should know: This is my first scope with a mil-dot reticle and I found it very easy to work with. The heavier pellet of the same brand I use hits two dots below center at thirty yards. Knowing this and having the turret set to zero for one of the pellets means I can be on center target with the first shot from the other weight pellet. Things I liked: Side focus knob (added the wheel), mil dots, light weight! The turrets lock and zero, and have no caps to keep track of. Things I would have changed: Make this with illuminated reticle. Also, the finish on the sun shade is of a slightly different texture, it doesn't precisely match the scope tube. What others should know: Be sure to tighten up the quick-release scope ring clamps. If loose they will shift with every shot. To get a perfectly parallax-free view you have to find a balance between the magnification selected, the AO focus and the ocular (eye piece) focus. Buy the side wheel, the AO knob is pretty stiff without it. Things I liked: Small and lightweight and clear. Love this scope. Couldn't find a scope to put on my .30 Hatsan 135. Went through a few scopes and finally found this one and decided to give it a try. Perfect match! Dosen't add much wt. What others should know: Short scope and will effect your eye relief. PA sells one piece mounts that can be off set. Would recommend buying a one piece mount so you get your eye lined up better. Keeps me from having to crawl up the stock to see through scope. Things I liked: Good small scope . Things I liked: Optics are amazing on my Marauder .22 Pistol. Things I liked: Compact & lightweight - Side Focus - Focus dials down to 9 feet - Good edge to edge clarity through all magnifications - 12x is great for zooming in on your target and is a huge improvement over the 3x-9x Bug Buster - Mil Dot is almost mandatory for accurate Airgun hunting beyond your zero range - great fit & finish...this is the best Bug Buster yet!!! Things I would have changed: The saddle of the scope is deeper than previous models (probably due to the side focus feature) and will not fit one piece mounts - I tried UTG & BKL and it's not happening. You will require 2 piece rings to mount this on your gun. What others should know: You won't be disappointed with this scope! I'm considering changing *all* of my Airgun scopes to this scope due to weight savings and compactness alone. I'm no expert, at all, but this review sold me on the 12x bug buster. I was looking at the 3x and 6x, trying to decide and finally decided the 12x is for me. I actually LIKE that it is not illuminated like the other two. It is so easy to forget to turn them off, plus, if you don't use it for a long time you might discover corrosion from a bad battery. I also like the ability to zoom in so you can see your holes in a paper target, without having to move from your shooting spot. Plus it seems to have the best "true" mil dot. Thinner lines let you see more of your target. I still don't know for sure about the scope rings. Some say they come with good ones and some say you need a one piece mount. I want one for an Air Arms Tx200 HC and I don't understand what to buy for it. It is a dove tail mount. That's not true about the 1 pc. mount. I used PY-A-5395 1 pc. mount and it works perfectly. It is a great scope. Things I liked: compact, side focus. The side focus is a huge plus for this scope. I have a 3-9 bug buster and the focus is finicky and targets are not as crisp as they are with the 3-12. Things I would have changed: Rings. 95% of the airguns I and fellow airgunners shoot have dovetail mounts. Either put dovetail in with the scope or leave them out. What others should know: you will want to use 2pc mounts. Things I liked: I have several Bug Buster scopes. I use them exclusively for my low power, short range rifles. Also on a Marauder pistol. I really like the close range focus. These scopes are a real value. Low price but decent overall quality. Things I would have changed: Offer a larger side wheel as an option. Things I liked: The price, in my opinion it is the most economical side focus scope. You can also buy a side wheel for this and I have one and love it. UTG has several so if you order one make sure it fits this particular scope. I own other UTG scopes that zoom to 9X and those scopes are mil-dot reticle, but they are not true mil-dot scopes; their dots only represent 0.9 mils. 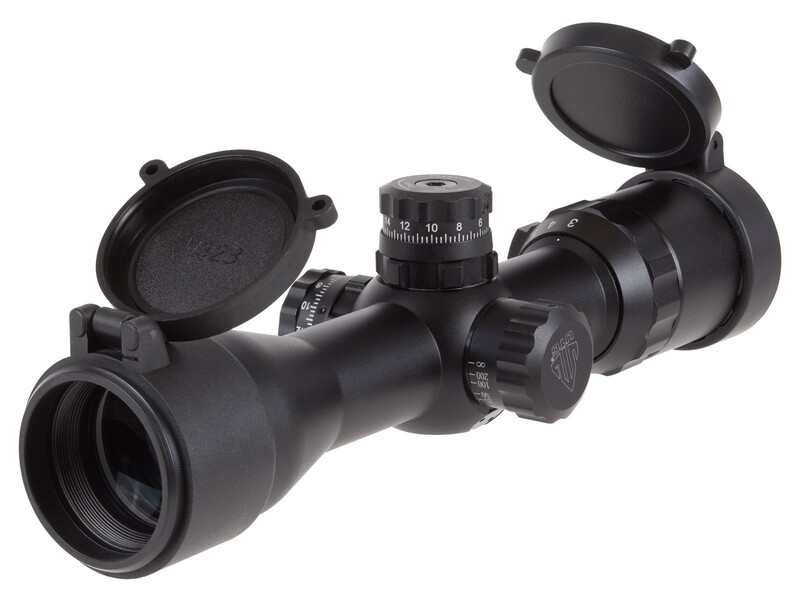 Since this scope (3-12X32) zooms up to 12X, at 10X it is in fact a true mil-dot scope. It comes with a metal sunshade which is great. It is very light and on my monstrously heavy bullboss that is a big plus. It also does the other stuff you would expect, the clicks are predictable and it holds zero. Things I would have changed: It is no fault of this scope, but I would like to see a larger diameter offering with side focus from UTG in this price range. Since it is only 32mm, at 12X the lighting needs to be good. The optics are as clear as you would expect at this price, but off center things do get a tad distorted. I wish it had mil-dot turrets since it has a mil-dot reticle, but everyone has the same dream there. What others should know: This is 1/3 MOA, just be mindful of that when making adjustments. It's feature per dollar ratio and quality is great, but I don't make elevation adjustments on the turret (I hold over); at this price point and associated quality I don't know that it could consistently. Disclaimer here, I have not done the box test with this scope and I would expect it to do fine, but for continuous elevation adjustment I still think over time you would see the zero wander. That is just an opinion, but I own this, I've shot through it, I've owned other UTG scopes; to think the zero would wander when making continuous turret adjustments for elevation would not blow my mind. But that's not to say this isn't a great little scope. I love mine and it does exactly what I bought it for; sit on my bullboss and get me on target. Thanks for the mil-dot lesson. I didn't know that about this scope. Things I liked: I read about this scope before it came out. As soon PA advertised it I purchased two. One is mounted on a ATN VULCAN BP. The other is mounted on a custom TALON P. Short focus, small profile, light weight. I wanted the most compact 3-12 on these guns. The glass is good for what it is. Remember my criteria. If there is anything with closer focus, smaller profile, and light weight. Please enlighten me. Things I would have changed: Illuminated reticule would be nice. And. Side focus wheel would be nice too. What others should know: If you feel the glass is not real sharp. Remember the scope is only $108 bucks It is what it is! Things I liked: Short,light weight,cool looking on my HW 30, has a side focus and holds zero pretty well. What others should know: It's a little to soon to be giving a review on a scope when I only have a few hundred shots with it on my HW30. You would think it should last forever on a little smooth springer with vortex kit, But all springers kill scopes. Leapers has the only scope that will hold up to my HW95's, Beeman,s and RWS guns and it's the 10x44 30mm compact that PA does not even sell. I have 4 and they are on all my higher recoil guns. Some with well over 50,000 shots and only minor adjustment from time to time. I have had a lot of the scopes they claim will hold zero up to $300.00. (Hawke, bushnell, Simmons, even some Leapers )Junk when you mount them on a springer. Don't believe those U tube air gun scope experts. Got 3 bug busters but this is my first side focus. Hope it holds up. PS. multiple mil dots are the only way to have fun shooting quality air guns from 25 to 90 yds. Things I liked: Very clear viewing optics. I'm not sure I'd be able to literally shoot a bug at any great distance, but that's more me at fault than the scope. Mounted on an older Diana 34 with the Vortek spring kit, this thing has held zero for well over 100 shots without loosening. I'm using some Leapers Accushot Rings, High Rise 9.5-11.5mm Dovetail versions and they work great. The zoom is a nice to have, at 12x at 60' (my indoor range) I can clearly see a bullseye printed no larger than the .177 pellets I'm shooting. At 3x, I'm still seeing plenty to shoot 1/2" groups. I'll probably try one of the fixed zoom illuminated versions next. Parallax Adjustment is very nice. For a cross-dominant shooter with glasses, I'm shooting way better than I used to with a less adjustable scope. Elevation and windage adjustments feel great and lock in nicely. Overall compact size is very nice and fits the dimensions of an air rifle very well. Things I would have changed: I did get a slight POI shift through the zoom range. Above 3x, I shoot about 1-1.5" high at 60' depending on the zoom level. I could re-zero and hold zoom, but what is the point of a zoom scope if you can't change it? I confirmed that after zeroing the scope in by taking 5 shot groups of this rifle's preferred pellet (JSB Match Diablo Exact RS 7.33gr) at each of the zoom settings (4 thru 10) and consistently shot a bit higher than 3x. It could just be me, but 40 shots in a row slowly moving up through the range when windage stayed locked in confirms it to me. What others should know: I previously used the UTG scope droop mount made for the RWS break barrels and I couldn't get enough adjustment to zero a scope out. It way overcompensated, so the the normal mounts directly mounted to the gun and this scope combined work much better. I needed about 7MOA elevation adjustment down to zero this gun out. This is the only non-illuminated Bug Buster. I'd looked at the whole line for so long that I didn't realize this wasn't illuminated until I got it, a slight disappointment as I was curious to try illuminated, but not the end of the world.